Description: It's one-on-one hoops! 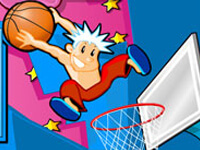 Can you become king of the court in this brilliant basketball sim?. World Basketball Challenge is a Basketball Games. Instructions: Arrow keys to move and space to shoot..